NASA has a bold plan to send astronauts to Mars by 2030 (or thereabouts). In preparation for this monumental Martian mission, the space agency needs to make sure everything's in order years beforehand. Although everyone should be taking care of their physical and mental health, whether they’re working on the International Space Station (ISS) or working at a desk, looking after your mental well-being is different in space. We asked Nicholas C. Salamon, Researcher at The Ohio State University, who's interested in tech applications that positively impact mental health on long-term space missions, what needs to be considered. “Happiness and mental well-being are important for most people, but mental health is especially important for astronauts on long missions simply due to the nature of their environment,” he told us. Luckily, astronauts are extremely well-trained. Not only that, but they have a support network that includes communication with people on the ground, time to relax and time to socialize. Traveling to Mars will come with its own set of challenges, all of which are impossible to recreate exactly on Earth. But that doesn’t mean that studying similar situations isn’t extremely useful in preparing for long-haul space travel. Environments like Arctic research stations and submarines can provide a useful context that could help us assess the psychological issues that might arise on a mission to the red planet. The most significant experiment taking place on Earth is NASA’s Human Exploration Research Analog, also known as HERA. It’s a closed habitat at the Johnson Space Center, which looks at the effects that confinement, isolation and working in remote conditions have on humans. It’s used to look into medical and physical issues, as well as behavioral health and performance. NASA divides these physical and mental health factors into five categories that are related to the pressures astronauts are subject to as they travel through space. There’s gravity fields, hostile/closed environments, space radiation, distance from Earth and isolation/confinement. There are plenty of physical health considerations, from making sure astronauts get enough exercise so their muscle mass doesn’t decrease too much through to ensuring they’re not exposed to too much radiation. While all of the above factors could impact the mental health of the crew, the main one that’s directly tied to wellbeing is isolation and confinement. “The more confined and isolated humans are, the more likely they are to develop behavioral or cognitive conditions, and psychiatric disorders,” the NASA website explains. That’s why it’s been vital for NASA to study the behavior and mental health of people in confined spaces, like HERA, for a long time to address some of these issues. Interestingly, NASA has identified that sleep plays a big part in overall mental health, which won’t be a huge surprise for anyone who suffers from restless nights and bad moods the next day. That’s because the pressures of space, the lack of regular light and the confined surroundings make a regular sleep/wake cycle difficult to maintain. A number of solutions are already being tested (and used on space missions aboard the ISS) to address these issues, like actigraphy. This helps astronauts assess and improve their sleep and alertness by recording how much they move, and the amount of ambient light around them each day. There are also new and improved lighting solutions that use LED tech, and which will soon be used on the ISS to align astronaut's circadian rhythms in an attempt to improve performance and alertness, and aid better sleep. Furthermore, therapeutic activities are being introduced, such as journaling. The idea is this will give astronauts a safe space to vent their frustrations, as well as provide researchers with a tool to study behavioral issues. 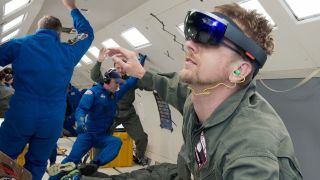 Virtual reality tech is already being used by both private space companies and space agencies to train astronauts on the ground and up in space. But the use of virtual reality as a medical tool has yet to be fully realized. Salamon produced a research paper that explored the ways VR could positively impact the mental health of astronauts on long missions. The first is that it can enable people to see virtual, natural environments. There have been countless studies about the efficacy of having people view nature scenes to decrease stress, which could be even more powerful up in space. Not only can nature scenes ease stress, they could also provide a calming and confidential environment that feels private in the confined and intense conditions of a spacecraft. NASA has been using VR to train astronauts for years. Here’s mission specialists preparing for a mission to the ISS with the help of a headset and gloves from 2010 at the Johnson Space Center. VR has been used as a form of stress management and even pain management in a number of scenarios, from diagnosing and treating anxiety to dealing with PTSD, so it makes sense that Salamon and his team would point to VR’s ability to provide the same benefits to astronauts. A 2006 study found that pairing indoor exercise with a VR headset produced calming effects, which were even more calming than exercising outdoors among nature. Therefore, one way to deliver VR experiences might be to combine the technology with exercise. The UK's National Health Service is investing in VR therapy as a way to treat a number of mental health problems; although, as with all aspects of VR, more research needs to be done in order to determine whether it’s as effective as it appears to be in initial trials. It’s clear that, as tech advances, there could be huge opportunity for VR to help calm people and assist them in working through problems, whether their feet are planted firmly on Earth or they're on their way to Mars. The great thing about VR is it’s versatile. This means that although it can be used to calm people and give them alone time in nature, the right experience could also help them to feel more connected to others. “Basically, the flexible nature of VR means it could potentially be used for relaxation, stimulation, socialization, exercise... the list goes on,” says Salamon. It can also be used as a way for them to better communicate with friends and family on Earth. This could make astronauts feel less lonely, and they may miss their families less if they can interact with them regularly rather than just sending text-based messages or using video calling. Thanks to platforms like Facebook Spaces and vTime, developments in social VR as a means to connect people at great distances look promising, especially given advances in haptic touch technology. This could allow astronauts to even ‘touch’ their friends, partners and families from millions of miles away, which would foster an even greater sense of connection. It’s still early days in assessing just how useful VR technology could be to astronauts on long-haul missions, and Salamon’s research points to the need for more experimentation in this area. But given that VR is proving to be a valuable way of positively impacting on many areas of mental wellbeing, from calming stress to pain management, it seems likely it can be equally beneficial, if not more so, for space travelers. “It is possible to make educated guesses about the efficacy of these methods, but it will be very important to perform in-depth studies that allow researchers to learn what works and what doesn't, and even what strategies might actually create an adverse effect on mental health in space,” Salamon told us. After all, there’s a big difference between testing VR applications on Earth and on a spacecraft. “The social dynamic among a crewed Mars mission will be totally unique in many ways, which makes it hard to know which methods will be most effective,” Salamon adds.